Our range of products include spindle circular brush. We offer to our clients with an exclusive range of Spindle Circular Brush which are made up of top quality raw materials. 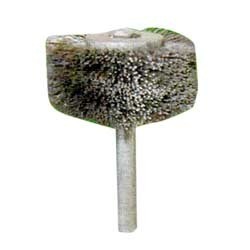 These brushes are mainly used for cleaning, polishing and finishing of equipments and machines in diverse industries. Owing to their high performance and durability these are highly demanded and appreciated by our clients. Further, we offer these Spindle Circular Brushes to our valuable clients at affordable and industry leading prices. Looking for Spindle Circular Brush ?